The John Dory Oyster Bar is Grand Central Oyster Bar on steroids, and is one of the more playful and reckless spaces that Roman and Williams has designed. 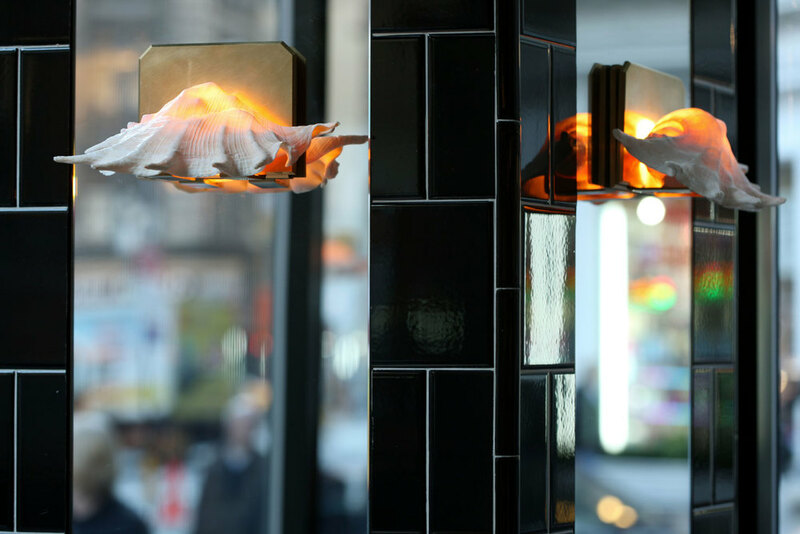 The John Dory is their second project with Ken Friedman and Chef April Bloomfield and is a strong contrast to the Breslin, the group’s first collaboration. It is a large, bright, highly colorful space with enormous windows and a shiny white oil painted ceiling. Ceiling trusses in bright green offset black tile and an original mosaic floor with gigantic fish tanks framing the bar. The space is outfitted with copper tables and a creamy tall bar. Electric blue and green stools create a pop utilitarian vibe. Shells act as lighting sconces, furthering the quirky, eclectic of the room. The massive windows, with all the lights and noise of Broadway, were used to balance the color and excitement of the interior to respond to the intensity of the street life.